The Signal and Information Processing for Sensing Systems group have revealed a new analytical technique that can be used to measure cannabinoids in plants and tobacco. 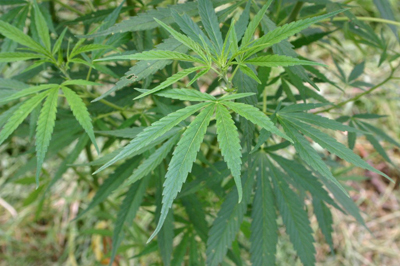 Working with the University of Cordoba, Santiago Marco’s group tackled the limitations of current analytical techniques used to determine cannabinoids in Cannabis sativa L. plants, which mostly rely on chromatography-based methods, which involve separating the components in fluid. The vast majority of modern industrial hemp varieties are characterized by a low content of Δ9-tetrahydrocannabinol (Δ9-THC), the main psychoactive cannabinoid, and have cannabidiol (CBD), a non-psychoactive isomer of Δ9-THC, as their predominant cannabinoid. Depending on the proportion of these two isomers, the hemp is characterized as fibre type or drug type. Additionally, in the past few decades, medicinal Cannabis varieties with different chemotypes have been selected, and some of these chemotypes are characterized for having different cannabinoids, such as cannabigerol (CBG), cannabidivarin (CBDV), and Δ9-tetrahydrocannabivarin (Δ9-THCV). In this context, it’s important to identify and quantify the different cannibinoids that could be present in a sample to determine if the hemp is fibre type or drug type. Knowing that thermal desorption–ion mobility spectrometry (TD-IMS) – which can identify ionized molecules in the gas phase – could be a faster alternative to obtain spectral ‘fingerprints’ of the chemical compounds from plant extracts, as well as from residues on skin after handling, the researchers describe how they combined TD-IMS with a strategy for data reduction and pattern recognition known as principal component analysis-linear discriminant analysis (PCA-LDA). Publishing in Sensors and Actuators, they describe their findings that the signals given by plant extracts and residues using this method could be assigned to clearly distinguishable cannabinoids and chemotypes. The possibility of false positive responses was also studied analyzing other non-cannabis plants and tobacco. “The equipment is portable and analysis time is very short, so TD-IMS and PCA-LDA together could be useful for on-site chemotaxonomic discrimination of cannabis varieties and the detection of illegal marijuana,” says Santiago. The group also recently published the results of their orange oil study, in which they invited IBEC volunteers to take part last year (Sensors 2018, 18(6), 1922). The paper presents a new strategy for the quality control of bitter orange essential oils without subjective methods.